THE OPPORTUNITY: Creating customer-focused websites that are more engaging, yield more inquires, and generate more revenue than traditional "corporate" sites, using these 4 Best Practices. 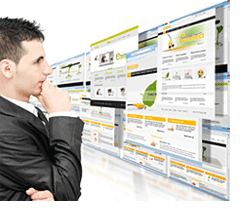 To get customers to interact with your enterprise, websites today must provide a multi-dimensional experience. This means abandoning the old and familiar one-dimensional, "corporate brochure" web experience. Best Practice #1: Help visitors connect with peers. In-depth interviews with customers across all major industries indicate that interaction with peers who have similar questions and issues is just as critical as engaging with your enterprise. If your website is not yet a virtual gathering spot for engaged communities of customers, recommend you change that. Best Practice #2: Provide access to relevant subject matter experts. In addition to contact with peers, customers want direct contact with experienced experts who can serve as "virtual" mentors and knowledge resources. Your website must serve as a portal for these discussions. Best Practice #3: Provide easier and faster access to your company. The key words here are “easier” and “faster”. Many of your customers will expect an initial response to a question or problem within a matter of minutes ... and, after querying you, will check to see whether your competition is capable of meeting that standard. ⇒ An initial phase in which they quickly decide whether to bail on your message or keep reading. ⇒ A second phase in which they scan and evaluate your content to determine its relevance to their world. ⇒ And a third phase, in which they move from passive assessment to active contribution of thoughts, ideas, insights, and questions. Getting your website visitors to that third stage means more engagement, more inquiries, and more revenue ... but it also requires deep familiarity with your target audience and what it considers relevant. Insights from voice of customer research can help.